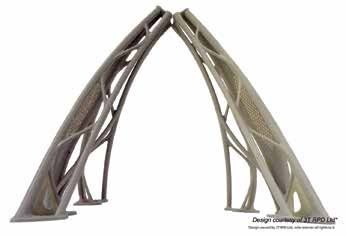 The design of this bio-mimetic bracket, 3D printed from Victrex PAEK material © 3T-RPD, was optimized for additive manufacturing. Photo courtesy of Victrex/PR Web. THORNTON CLEVELEYS, U.K.—Victrex has developed two new materials—a high strength material for laser sintering (LS) and a filament reported to have better Z-strength than existing polyaryletherketone (PAEK) materials—that the company is preparing for use in additive manufacturing. The high strength material for laser sintering attains lower refresh rates that result in improved recycling of unsintered powder, the company said in a press release. The filament material, in addition to having what is reported to be higher Z-strength than existing PAEK materials, is said to offer better printability for filament fusion (FF). Advantages of additive manufacturing can be deployed to reduce costs, shorten time to market, and enable the production of parts too complex to be manufactured using traditional methods. Incumbent PAEK materials on the market today, although used in some AM applications, were designed for conventional manufacturing methods, such as machining and injection molding. As a result, they have some features that aren’t optimal for additive manufacturing processes. A first generation of PAEK material for laser sintering can only be recycled to a very low extent, the company said, and requires nearly a full refreshing of the printing bed with new powder. At the same time, PEEK filaments available for filament fusion have poor interlayer bonding, leading to a loss in Z-strength. The new polymer grades developed by Victrex are reported to have shown “encouragingly low refresh rates,” which improve recycling of unsintered powder, with similar mechanical properties in laser sintering. In filament fusion, they have shown “good mechanical properties and printability,” according to Victrex.